No matter your purpose for sailing the high seas or kayaking the coves, you’ll need to know where you can safely moor your watercraft and gather those all-important mariner supplies. 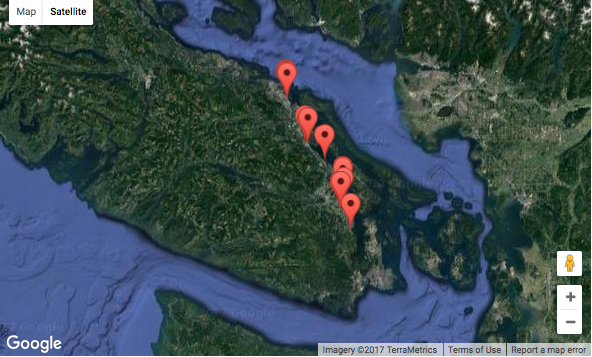 Here is a list of Marinas between Mill Bay and Nanaimo. Mill Bay Marina: Offers long and short term moorage for boats up to 88 feet and temporary moorage for boasts up to 200 feet. Free wifi at the slips. Prices are listed on their web site. Oceanfront Grand Resort & Marina: Guests of the restaurant and/or resort are able to use the private dock during their stay. Cowichan Bay Fisherman’s Wharf: Call (250) 746-5911 for details and availability. Owned and maintained by the Federal Government of Canada through the Small Craft Harbours Branch of the Dept of Fisheries and Oceans. Cowichan Bay Marina: Slips are rented on an annual basis and can accommodate boats up to 60 feet. They do not offer transient moorage. Pier 66 Marina: Offers annual and seasonal moorage for boats up to 65 feet. Dungeness Marina: Offers annual, monthly and transient moorage for boats up to 92 feet. Genoa Bay Marina: Offers transient and annual docking services for boats 12 to 120 feet. Maple Bay Marina: Annual and seasonal moorage offered. Chemainus Quay & Marina Complex: Call (250) 246-2600 for information. Ladysmith Community Marina: A volunteer run community organization, Ladysmith Community Marina has a waiting list for annual moorage. Seasonal and transient boaters are welcome but it is recommended you contact them for availability first, particularly if you have a large boat. Ladysmith Fisherman’s Wharf: Offer some moorage to transient traffic and temporary moorage during the summer months. Call for details and availability: 250-245-7511. Owned and maintained by the Federal Government of Canada through the Small Craft Harbours Branch of the Dept of Fisheries and Oceans. Ladysmith Marina: Annual moorage for boats up to and over 100 feet. Townsite Marina: Currently accepting applications for their waiting list. Waterfront Suites & Marina: Annual moorage for boats up to 80 feet. Newcastle Marina: Semi-annual and annual moorage. Stones Marina & Boatyard: Moorage for boats up to 55 feet (in-line moorage for up to 70 feet) for monthly, quarterly, bi-annual and annual contracts. Gas N Go Marina: Call 250-591-0810 for information.